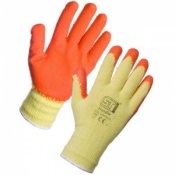 For medium-weight work and general handling tasks, your fingers need both freedom of movement and protection. 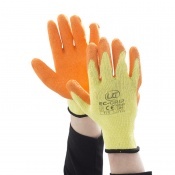 The Ejendals Tegera 90065 Ladies Gardening Gloves are flexible and durable nylon gloves palm-dipped with nitrile, which provides water-repellent properties in the palm. With a sandy finish that provides good levels of grip, the Ejendals Tegera 90065 are best suited to gardening and agricultural work. 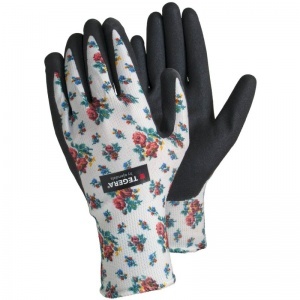 The Ejendals Tegera 90065 Gloves are supplied in a black/white design with decorative rose patterning. They feature a knitwrist cuff for additional comfort. The product code for these gloves is 90065. The Ejendals Tegera 90065 are offered in three different sizes, the dimensions of which can be found below. To measure your hand, measure the circumference of your hand around the knuckles (excluding the thumb) with your hand open and your fingers together.